Each year people from different walks of like are awarded the “HUMLOG Award”, this prestigious award is recognition for all the hard work and dedication put into their respective field of work. Be it social, Every year they are organizing culture program and Award Night from past 44 years to fecilate actor, actresses, Producer, Director, Choreographer, Film and TV artist, Music, Director, Playback singers, educationist, Journalist and others social personalities for outstanding service in their respective field. This year “HUMLOG Award” was held in Mumbai. 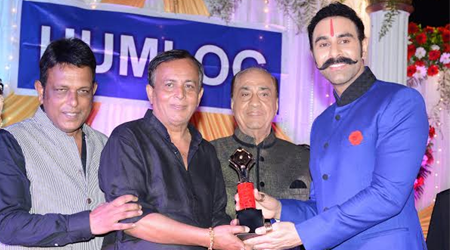 At this grand award event held in presence of big dignitaries of India, world renowned dancer choreographer Sandip Soparrkar was awarded the “HUMLOG Award” in the field of choreography and dance. Sandip has choreographed for films including 7 Khoon Maaf and Kites among others, and has popularised Bollywood dance on international platform. Through this art, he has also raised funds for various causes the world over. Sandip says, "I am humbled that my hard work has been applauded”.